Logic, certainty. Acting with full understanding, expressing ideas precisely. 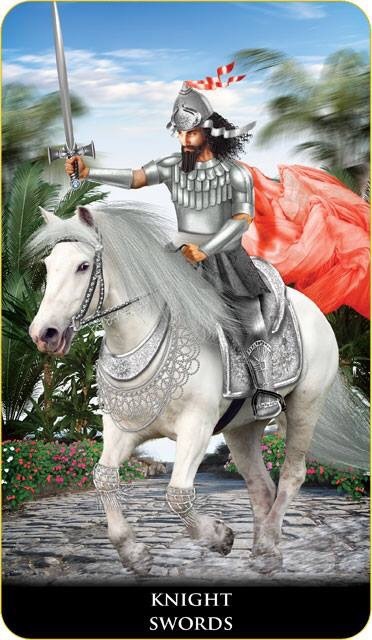 A knight in the shiny armor with a sword in his hand rides the white horse through a park. The horse gallops towards the strong wind which inflates the knight’s red cloak and shakes the tops on the palms on the picture’s background. The wind is a metaphor for the primary energy of this card: Air. The knight’s facial expression betrays his features: he is a person, who acts with certainty, relying on logic and rejecting any emotions. He is direct and sharp in his decisions, and he supposes feelings as irrelevant and superfluous. Knight of Swords represents a person who can apply logical mind and reasoning in a difficult or complicated situation. He acts with full certainty and without emotions. Emotion, uncertainty. Acting imprudently, being evasive. This entry was posted in Artist, Deck Review, Featured Card of the Day, General Tarot, Readings and tagged Knight of Swords, New Babylonian, Roxana Paul, Tarot.